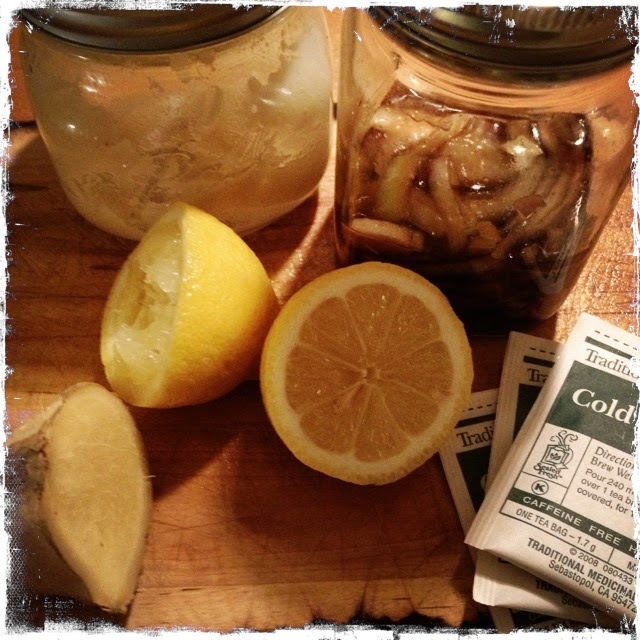 flu remedies… | maya c.
Cough, cough, sniff, sniff. Yup, it’s that time of year. Half of my office is out with something or other. I came down with some sort of bronchial disaster this weekend. Late last week, I started to feel woozy. By Sunday night, I was a fevery, coughy, sniffly mess. A few years ago, I was very prone to a lovely combo of bronchitis + pneumonia + nasal infections. I’d be out for a week and overly-medicated with antibiotics and puffers. Sometimes they were necessary, sometimes they were not, but always they destroyed my stomach for months to follow. I desperately wanted to avoid antibiotics this time around… so I got to work. I cured myself (almost!) with these very simple, natural remedies. Place all ingredients in a mug, stir, let sit for a minute or two, and drink! This is pretty much all I drank for days. Lemons are packed with vit C, ginger is nature’s antibiotic, and honey has awesome antimicrobial properties. Best part: this is delicious! Drinks lots and lots of it! In a mason jar, layer onions then a glob of honey/ sugar, onions then glob of honey/ sugar, onions then glob of honey/ sugar, etc. Seal and let it sit on the counter for 6-8 hours (or overnight). Drink 1-2 tbsps as needed to calm the coughing. Use it up in a few days as it’s got to be fresh. If you have a Polish grandma, you have probably tried (a.k.a. been subjected to) this deliciousness before! You’ll probably also remember that while it smells horrendous, this syrup actually tastes quite nice (I hate onions and even I like this syrup) and it works like magic. Onions contain a compound which helps reduce bronchial constriction and they help eliminate mucus (gross). Sugar is ok but honey is far better as it’ll kick bacteria to the curb. When you’re sick, it’s important to avoid the foods that cause inflammation (as your body is already trying to fight inflammation). So, no alcohol, coffee, dairy (mucus-producing), sugar, processed stuff, etc (sorry!). Instead, you need lots of green veggies and chicken soup. Why chicken soup? Chicken contains compounds that thin out mucus so it’s easier to cough out (how many more times can I say mucus in one post?!) 🙂 If you’re veggie, just have broth with lots of anti-inflammatory ingredients like onions, garlic, carrots, etc. Oh, and did I mention garlic? Yes, eat LOTS of it. Truth: I’d be feeling much better if I had avoided the home-made cake and chocolate truffles left over from my hubby’s birthday this weekend! Ha, betcha didn’t see that one coming! 🙂 But really, it’s the most essential one. You need to slow down, sleep ridiculous amounts, and stay in your pjs until they start to smell a bit suspicious. The main reason I’m not 100% better is because I made the “daft”, to quote my British colleague, decision to go into work today. Don’t be me – no one wants sick coworkers around. You’re not a brain surgeon and even if you are, you need to rest! I certainly don’t want a sick brain surgeon coughing into my open skull! That’s it! And here’s the thing, if you try all of the above and they don’t work, no harm done. You can always go to the doc after, but I suspect you won’t need to.